– SNAKE brand snake guides and Fuji SIC Titanium frame stripping guide(s). – Gorgeous Lemke seats with choice of wood for freshwater rods – Lemke double locking seats on Saltwater models. Taylor Phenom Fly Rods – PHENOM (DEFINITION): 1. A PERSON OR THING OF OUTSTANDING ABILITIES OR QUALITIES 2. A PERSON WHO IS OUTSTANDINGLY TALENTED OR ADMIRED, ESPECIALLY AN UP-AND-COMER. 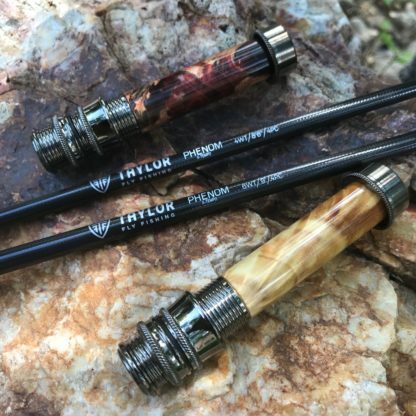 Taylor Phenom Fly Rods use our new X-Tempo rod design. When hunting for a buried treasure they say X marks the spot. Our X-Tempo rods perform at the perfect merger of tempo and stiffness. We really believe we hit the sweet spot when it comes to rod performance in the Phenom. The Phenom’s action is a fast action with a progressive curve and soft tip. We consider it a fast action rod with feeling and response.